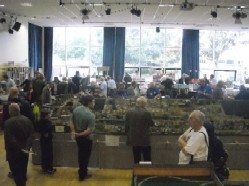 The club has it's own permanent 7¼" gauge miniature railway in the club grounds, with a mixture of live steam, electric and petrol locomotves. 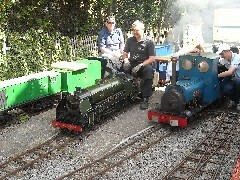 We hold monthly Steam/Open Days from April to September which are open to the public. One of the earliest members of the I & WEMRC was Dr Watts, back in the mid-1930's. He lived in a large house at Chigwell Row, and around the estate was laid a long and winding irregular circle of 7¼" gauge railway track, the main feature of which was a timber viaduct - some 30 feet long - built on a curve across the middle of the lake. It was the doctor’s custom to hold garden parties in the summer for the sole purpose of running sessions on his railway. His locomotive was based on the LSWR Urie 4-6-0 N15 class that subsequently became part of the King Arthur class and was named Excalibur (right). The war years played havoc with the track as it was impossible to carry out any maintenance, and by the end of the war, the deck and timber supports of the viaduct had rotted. When the doctor died, Excalibur, rolling stock and track were bequeathed to the club. We are currently rebuilding our resident steam locomotive ‘Excalibur’ and hope that she will be ready for our 2019 Open Days season. 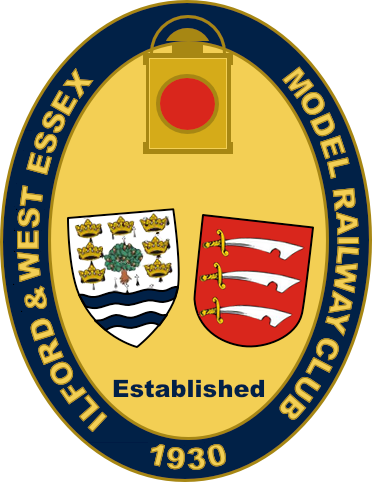 We also have a battery powered loco based on a Class 20 Diesel Electric locomotive as well as another loco ‘Chadwell’ which is an 0-4-0 battery powered loco. We also have a newly constructed 0-4-0 steam loco, and have also embarked on a Track Replacement programme with the first section now complete.